Got some green beans and don’t know what to do with them? 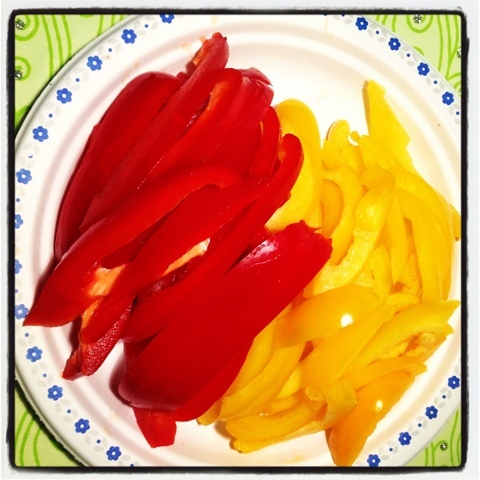 How about a colorful, sweet-and-salty side dish to go with your chicken, fish, beef or pork? 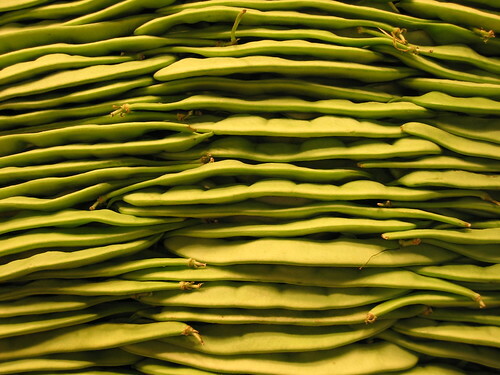 Take advantage of the new crop of green beans available at local farmers’ market with this really easy recipe. Ingredients: green beans, olive oil, vinegar, salt, pepper, 2-3 garlic cloves. Boil the green beans, drain and put in a bowl. In a separate small bowl, mix 2 tbsp olive oil with 1 tbsp of vinegar, then add salt and pepper. Peel and crush garlic cloves, then leave in mixture for 15-30 minutes. Remove and discard garlic cloves. Pour mixture over beans and mix well. Serve cold. Try it with polenta, it’s a perfect match! I should probably say right from the start that I do not like beans. I’ve never tasted any beans that I could say I like. Yet, I cooked some the other day. They turned out quite OK (but I still don’t like beans…). I got a bag of dry mix beans from Lina’s Market and the first thing I needed to do was to soak them. Soaking: Put the beans in a large pot and cover them with water (have water level some 3-4 fingers above the beans). Bring to a quick boil, then cover the pot and leave overnight in the fridge. Ingredients: Use some 400 gr dry beans, 1 onion, 300 gr pork cut into cubes, 200 gr sausage, 2-3 tbsp tomato sauce, 2-3 bay leaves, 2 cups of cooking wine, salt, pepper, marjoram, paprika. Drain water from pot and replace with same quantity of water, together with one glass of wine. Bring to a slow boil, removing the foam. Keep boiling until the level of the liquid starts decreasing. Finely cut 1 onion and fry gently with a bit of oil in a pan. When onion is translucent, add the pork cubes and the sausage (cut into small slices). Add a bit of wine, salt and pepper, and marjoram. Fry for 5 – 7 minutes, or until sausage is done. Put everything into the pot with the beans, and let boil. Add the bay leaves and the tomato sauce. The cooking time ranges between 2-4 hours, depending on how well your beans were soaked. Add salt, pepper and paprika towards the end. Tips: I read that you should add tomato sauce and salt really towards the end, to avoid beans giving you gases. Don’t know how true it is though. I’ve also read that you should always throw away the water in which the beans were soaked, again to avoid the gases.